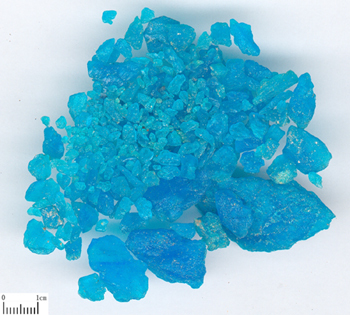 The blue vitriol or manmade hydrous blue vitriol (CuSO4 •5H2O) of the family Vitriol. Big, blue, transparent, brittle and without impurities. Grinded or grinded after calcined in the fire. Bitter, astringent, cold; toxic; liver, stomach, spleen, and gallbaldder meridians entered. Induce vomiting, remove toxicity and dry dampness, corrode to eliminate putridity. It is a common used emetic herh because of its strong action of promoting vomiting. It is indicated for all the diseases of which the vomiting promoting should be used. For inflammation of throat, acute throat troubles, the tract obstructed by phlegm and the drag-saw-liked voice, it is combined with wind-extinguishing and phlegm-dispelling herbs, For instance, it is used with Jiang Can in the formula Er Sheng San from Ji Sheng Fang. For epilepsy due to wind-phlegm, it is smashed into powder and taken with warm vinegar singly from Tan Shi Xiao Er Fang. For be poisoned by mistaking, it could be dissolved in warm water to promote vomiting to dispel toxin. It can remove toxin and dry dampness when it is used externally with its low concentration pharmaceutical preparation. For aphtha, it could be smashed into powder with Chan Su and externally applied which is recorded in Sheng Hui Fang. For ulcerative gingivitis, it could be smashed into powder after calcined and pasted on the affected area, or combined with dampness-drying and heat-clearing herbs. For instance, it is used with Er Cha and Hu Huang Lian in the formula Dan Fan San from Shen Shi Zun Sheng Fang. For blepharitis, it could be smashed into powder after calcined and dissolved in water for douche. It can corrode and eliminate putridity when it is used externally with its high concentration pharmaceutical preparation. For pervade swollen of sores, it could be smashed into powder for external application from Zhi Zhi Fang. For pain due to necrotic rissue, incessantly of pus and bleeding, it could be smashed into powder for external aplication to corrode and eliminate putridity. Internal use 0.3~0.6 g for pills or dissolved in warm water; an appropriate dosage for external usage: Puff with its powder or paste with it, or dissolve it in water for douche. It is contraindicated in the case of the weak constitution. Internal use of the herb could impair the mucosa of mouth or stomach, therefore, it is better for external use.